Deep Creek Lake and the pristine, rugged Allegheny Mountains of western Maryland, provide a venue of unmatched beauty and stunning scenery. Swim in crystal clear Deep Creek Lake. Ride the smooth, remote, and challenging roads of Garrett County. Run the Deep Creek State Park trails and surrounding lakeside roads. 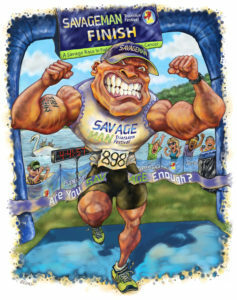 The SavageMan Triathlon Festival races will challenge and awe every participant. If such a triathlon appeals to you then you will love the SavageMan Triathlon Festival. For 2019 we have reverted to the Classic SavageMan courses and format, with a twist. Friday 5PM – SavageMan Swim-Run #GoKinetic Prologue – 250m/1mi/250m/1mi/250m/1mi. This spectator friendly event takes place entirely within 1/2 mile of the beach. Watch your favorite athlete race by 3 times as they vie for top tier placing. 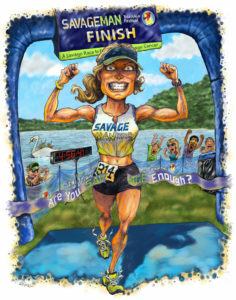 Saturday 9AM – SavageMan 30 Olympic- Classic, challenging course with Bumblebee, Foy and a 2 loop run. Saturday 9:30AM – SavageMan 20 Sprint- Classic course with a flat, out and back bike. Sunday 8:30AM – SavageMan 70 Long Course – Classic course with Westernport, Big Savage Mtn, Killer Miller and the Fire Tower Trail (2 loops). 3 days of racing. $10,000 in prize money. Lowest cumulative time wins. Select Big Savage Challenge when registering for a multi-event discount. 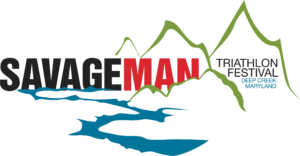 We are excited to bring more racing to the The SavageMan Triathlon Festival and bring back the classic 70 & 30. We have more events/activities in the works, so rent a lake house with friends and stay Friday through Monday, we promise, the trip is worth it! Deep Creek Lake State Park is a top East Coast outdoor training destination. Hiking, road and mtn biking, trail running, kayaking and paddle boarding are all available within minutes of the race site. Don’t wait, sign up today. Be sure to watch our 2017 race videos, then sign up below. Learn more about the area and plan your Deep Creek Experience. The SavageMan 70 consists of a 1.2 mile swim, a 56 mile bike, and a 13.1 mile run. The SavageMan 70 is not for everyone and is not a PR course. It is a test of an athletes grit in one of the prettiest parts of the country and is a bucket list race you’ll want to do year after year. Bike Course: The SavageMan 70.0 features a gorgeous and truly savage bike course and is the reason you want to do this race. Rural, well paved roads will take athletes through scenic farmland, forest and along trout filled rivers. Shaded, technical descents greet cyclists as they wind their way down Spring Lick and along the Savage River to the Westernport Wall where all athletes hope to earn their brick. From there you’ll have the ascents and descents of Big Savage Mountain, Otto, Jennings and Killer Miller. This is an amazing bike course that any serious athlete needs to race during their triathlon career. Run Course: The 2 loop, 13.1 mile run course is almost 100% shaded and is a mixture of gravel roads, walking trails and paved roads. It begins with a nice tour of the lake shore and loops around the Discovery Center, campgrounds, along State Park Road and finally up the Fire Tower Rd. Once back on State Park Road runners will follow the last mile of the run course through a cathedral of pines on a nice, level, gravel road leading to the finish line. Do the Double: Would you like to race both days of the Savageman Triathlon Festival weekend? If so when you register for the 1st race you will be prompted to register for the second race saving you 20% off the highest price race! If you are registering for the Big Savage Challenge it will be it’s own option when registering. Race management and medical personnel reserve the right to pull any athlete from the course if it appears that they are not sufficiently trained to complete the remainder of the course in the allotted time and in a safe manner. The SavageMan 30.0 Triathlon provides athletes a beautiful, shorter, and less Savage triathlon alternative to the SavageMan Long Course. The 30.0 is an Olympic distance triathlon consisting of a 1500 meter swim, 22.9 mile bike, and 6.2 mile run. Swim Course: The swim takes place in the cool, crystal clear waters of Deep Creek Lake and features an in water start and sandy beach finish. It is a rectangular course with yellow triangle turns at orange sighting buoys every 75 meters. The swim takes place in a corner of the lake surrounded by the forested hillsides of Deep Creek, it is an amazing swim. Bike Course: The Classic SavageMan 30.0 features a gorgeous bike course that starts and finishes fairly level, but has several challenging ascents (and descents) throughout. This Olympic bike course is truly something special and is worth the trip alone. Run Course: The 6.2 mile run course is almost 100% shaded and is a mixture of gravel roads, walking trails and paved roads. It begins with a nice tour of the lake shore and loops around the Discovery Center and campgrounds then finishes through a cathedral of pines on a nice, level, gravel road leading to the finish line. The SavageMan 20 consists of a 750 meter swim, a 15.5 mile bike, and a 3.1 mile run. The shortest triathlon of the weekend, this premium race is a great choice for those that want to experience the beauty of the area without all the climbing on the bike course. Swim Course: The 750 meter swim takes place in the cool, crystal clear waters of Deep Creek Lake and features an in water start and sandy beach finish. It is a rectangular course with yellow triangle turns and orange sighting buoys every 75 meters. The swim takes place in a corner of the lake surrounded by the forested hillsides of Deep Creek, it is an amazing swim. Bike Course: The SavageMan 20.0 bike is a rolling, relatively flat 15.5 mile course that weaves along the lake on a beautiful ribbon of pavement surrounded by forests and farmland. After a quick turnaround at mile 7.5, athletes will fly back to transition area where they will tackle the 5k run course. Run Course: The 3.1 mile mile run course is almost 100% shaded and is a mixture of gravel roads, walking trails and paved roads. It begins with a nice tour of the lake shore and loops around the Discovery Center before venturing up into the campgrounds. The run then finishes through a cathedral of pines on a nice, level, gravel road leading to the finish line. It passes by the transition area and race site before a turnaround brings you back to the finish line. We are excited to announce the “The Big Savage Challenge” featuring 3 days of racing at Deep Creek Lake and Garrett County. Athletes must complete the Swim-Run Prologue on Friday, the 30 (Olympic) on Saturday, and the 70 (Long Course) on Sunday. The top 5 M/F athletes with the lowest combined times will split the $10,000 prize purse. This Swim-Run Prologue is a #GoKinetic, no holds barred sprint extravaganza featuring a 250 meter swim followed by a 1 mile run. Athletes must do 3 loops of the course and can wear a wetsuit and shoes the whole time, or not. Wear paddles or carry a swim buoy. It’s totally up to you and the only rule is that if you start with it, you have to finish with it. No transitions, no bikes, fastest time wins. This event must be done if you are in contention for the Big Savage Challenge $10,000 Prize Purse. Race Starts at 5 and course closes at 6. Rain date is Saturday at 5PM. There will be a wave for athletes competing in the Big Savage Challenge and a wave for folks that just want to try this format. It’s going to be fast, it’s going to be fun. Bring friends. Swim Course: The 250 meter swims take place in the cool, crystal clear waters of Deep Creek Lake and features an in water start and sandy beach finish. It is a short rectangular course with two yellow triangles for the turns. Run Course: The out and back 1 mile runs are almost 100% shaded and are a mixture of gravel roads and paved parking lots. Prologue athletes will run through the finish chute when starting their 2nd and 3rd laps. Prize Money: The $10,000 prize purse will be awarded equally to the 5 Male / Female Athletes competing in the Big Savage Challenge with the lowest combined times across the Prologue, 30 & 70 triathlon categories. Athletes must complete all 3 events to be considered. Swag: All athletes receive a Tri-Blend Race Shirt, Custom Race Socks and a super cool custom Finisher’s Medal. Also, don’t forget the DJ, bounce house for the kids and fabulous post race spread. Race categories available for this race are Age Group, Aquabike, Relay teams, Clydesdale, Athena, Military, Collegiate, High School and Novice. All categories are scored 3 deep with Aquabike going 5 deep M/F per event. Water Temperature: The water is expected to be in the mid to upper 60’s. Chessie Photos will be attending this event capturing images throughout the race course. Athletes will receive a customized email after the race with automated links to find your images. You may also go directly to their website to review their custom products, and purchase your photos from this and other Series Events. With a total of over thirty years of experience in the Deep Creek Lake vacation rental market, Railey Mountain Lake Vacation’s friendly staff are experts in the industry and are committed to making your Deep Creek Lake housing an unforgettable experience! Railey Mountain Lake Vacations offers a wide selection of houses. Call 866-966-3280 for more information and be sure to mention SavageMan Triathlon to receive a 10% discount on rental homes. Taylor-Made Deep Creek Vacations offers 1-8 bedroom chalets, cottages and condos around the Deep Creek Lake area and exceeds expectations with award-winning customer service. Stay 3 nights for the price of 2! Ask your reservationist for more details! 1-866-351-1119 or www.deepcreekvacations.com. The Suites at Silver Tree is offering a 10% discount for a two-night rental and a 20% discount for a three-night rental over SavageMan weekend. Suites at Silver Tree is the closest lodging to the State Park race site. Call 800-711-1719 for more information. There is an enormous selection of rental houses on and near Deep Creek Lake that can accomomdate from 4 to 25. See the Chamber of Commerce for additional rental house options. There are many hotel and motel options near Deep Creek Lake, particularly near the ski area. See the Chamber of Commerce for hotel and motel options. Many of the nearby State Parks and Forests have campgrounds, and the campgrounds at Deep Creek State Park are large and convenient. The SavageMan Triathlon run courses go right through this campground! Campgrounds are also available at the BumbleBee Campground and at the following nearby State Parks: New Germany State Park, Big Run State Park, Savage River State Forest, Swallow Falls State Park, and Herrington Manor State Park. Nights get cool in September so plan accordingly.